I created this recipe in Colorado, where I had ready access to that state’s Haystack Mountain Goat Dairy’s sublime cheese called Haystack Peak. 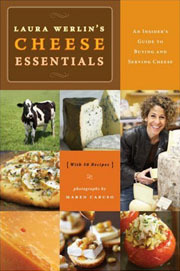 If you can get that cheese for this or any other dish, do it! The vinegar and the creaminess of the lentils are a perfect match for a creamy goat cheese. 1. Fill a 2-quart saucepan about halfway with water. Add the lentils and garlic. Bring to a boil, then reduce the heat to a simmer. Cook, uncovered, until the lentils are tender but not mushy, 15 to 20 minutes. Drain in a strainer or small-holed colander. Remove and discard the garlic and let cool to room temperature. 3. In a medium-size bowl, mix the lentils with the scallions, carrots, celery, and cucumber. Add the dressing and mix gently. Add a little salt, then taste and adjust the seasoning if necessary. Let sit for at least 15 minutes and preferably up to 1 hour at room temperature. 4. Cut the cheese horizontally two-thirds of the way down from the top. Cut the two pieces into quarters by crisscrossing to make 8 triangular pieces. If you’re not using a pyramid-shape cheese, then simply cut the cheese into 1-ounce portions. 5. Put about 1/4 cup lentils on each of 8 salad plates. Lay a piece of cheese on the side of the salad (rather than directly in the center) but still touching the beans. Garnish each plate with a dill sprig. 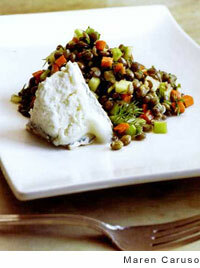 Goat Cheese and Lentil Salad Recipe © 2007 Laura Werlin. Photo © 2007 Maren Caruso. All rights reserved. All recipes and photos used with permission of the publisher.